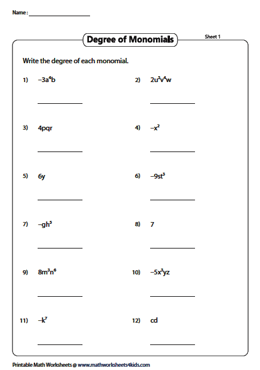 Get ample practice on identifying the degree of polynomials with our wide selection of printables that have been painstakingly crafted by our team of educational experts. 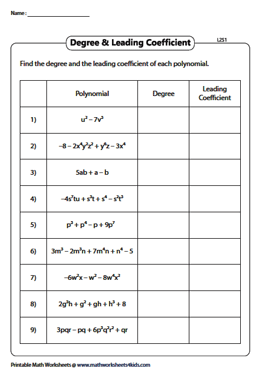 Exercises featured on this page include finding the degree of monomials, binomials and trinomials; determining the degree and the leading coefficient of polynomials and a lot more! Use the various download options to access all pdfs available here. To determine the degree of the monomial, simply add the exponents of all the variables. Note that the variable which appears to have no exponent actually has an exponent 1. To determine the degree of the monomial, simply add the exponents of all the variables. 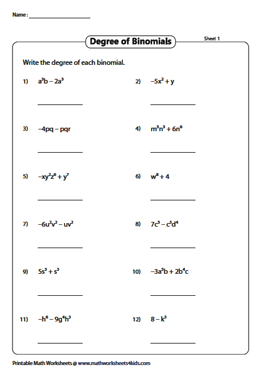 Solve this set of worksheets that deals with writing the degree of binomials. Find the degree of each term and then compare them. The highest power is the degree of the binomial. 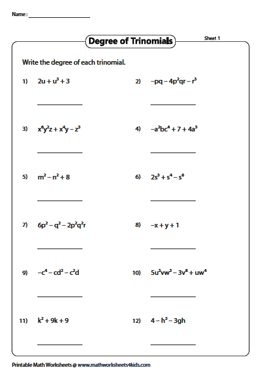 Engage students with these practice worksheets to find the degree of trinomials. Determine the degree of each term. The greatest value becomes the degree of the trinomial. Determine the degree of each term. Then, compare them to ascertain the degree of the polynomial. Find the degree. Next, identify the term with the highest degree to determine the leading term. The coefficient of the leading term becomes the leading coefficient. This level contains expressions up to three terms. 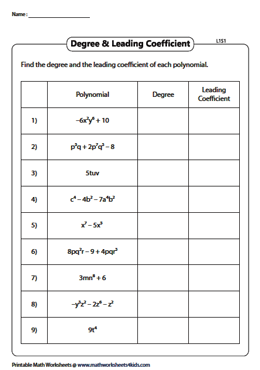 Level 2 worksheets require learners to determine the degree and the leading coefficient for all the given polynomial expressions. Note down your answers in the table provided. 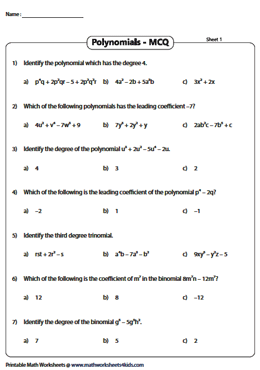 Review a student's grasp in identifying the degree of polynomials and leading coefficients with this batch of MCQs. Employ the answer keys to verify your responses.